"I am concerned about a family history of disease or have symptoms I am experiencing." If you or a family member have a diagnosis or symptoms that may indicate a hereditary condition, Genome Medical can guide you on your journey. We are your gateway to the world’s most advanced genomic medicine. Conveniently schedule an appointment online. We offer next day appointments, including evening and weekend hours. We assess your family history and risk factors to understand if genetic testing is right for you and to ensure you are receiving the most appropriate genetic test. If you decide to pursue testing, we will ship you a collection kit or schedule a blood draw at a time and place convenient to you or your family. 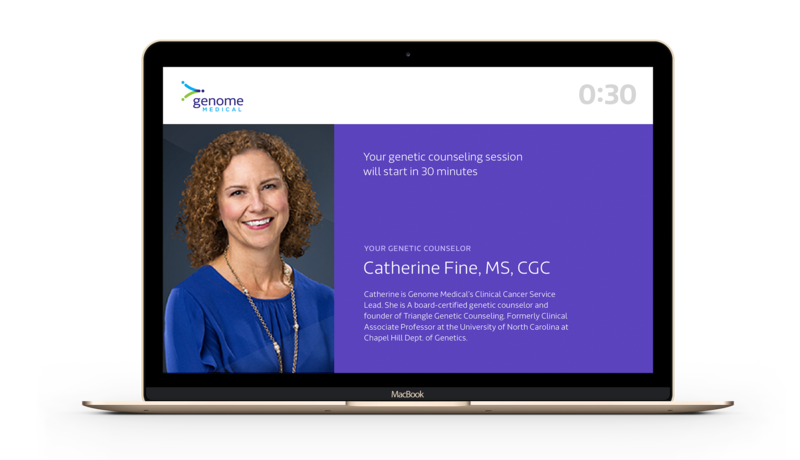 We review and interpret your genetic test results and develop personalized care plans for you based on your results. We provide actionable steps and work with your treating physician to incorporate the information into your health care and provide personalized treatment plans if applicable. Our team is able to refer to specialists where needed. Is genetic testing medically indicated? Consult with our expert care team and go over your personal and family health history to determine if testing is recommended. Will insurance cover the services and genetic test? Provide your insurance info and we'll take it from there (from a benefits investigation to submitting the claims). How do I get the genetic test? If you decide to proceed with testing, we select the right lab and test for you and make it easy to provide a DNA sample. You can consult with a genetic expert to go over the results, and we’ll communicate with your doctor too at your request. Advanced Genomic Care not what you’re looking for? We have other genetic wellness options for you and your family.